Soundtrack: None. Skipped for being too obvious. The words "Big Shot" were all the information that our participants had to figure out what to do next. Seems like a pretty obvious course of action, don't you think? High above the glistening lights of the Strip, Game Players arrived at the top of the Stratosphere needing to locate and retrieve the next clue. The most likely way to do that? GET ON THE RIDE. The Big Shot attraction has four sets of four-seats-each surrounding a giant pole, so that its 16 riders have a view in all directions. 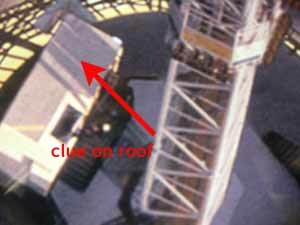 A cursory inspection of the ride loading area reveals nothing... so the clue-searchers must buy a ticket and strap in. The ride shot upwards into the Vegas night, and as it began its descent suddenly the next clue became visible-- attached to the rooftop of a small control shed next to the loading area, is a giant A# number. See & memorize that number, or you'll be riding again. As soon as 2 days before the actual Game, we weren't certain that the Big Shot location would be possible to use. The management hadn't been in touch with us, and we were very concerned that the game was too long, so we debated a great deal about whether to cut the site. On Friday, we got a phone call from the management, and Kevin immediately went up with the sign to mount it to the roof. The orginal A# number was many more digits long-- something like 7327492. We thought it would be more interesting if players had a difficult time getting all the digits. In the end, the decision was made for us, when the Friday-night windstorm blew through town: in the high winds, part of the sign ripped and blew off the roof, and all that was left was "A#73". Given our flexible IT department (Walter), we knew it would be a lot easier to change the A# number in the database than it would be to go back to the roof of Big Shot, so the A# number was changed.